Have you ever asked yourself the question "Can I afford to buy a house" or "What mortgage can I afford"? This calculator will help you determine whether buying a home with a mortgage is realistic taking into account your current finances. This data is taken from the Nationwide House Price index and represents the average price of a house. This calculator makes a number of assumptions and results should only be used as a guide. Affordability ratings should only be considered as an indicator of affordability and should not be considered as financial advice. Please speak to your lender or independent financial advisor for more substantial mortgage advice and eligibility. The purpose of this mortgage affordability calculator is to help people reason about their ability to afford a mortgage. Are thinking about buying a home but are unsure of what a mortgage might cost and whether it is affordable. Are already on the housing ladder and want to move to a new property. A useful report that includes mortgage repayment details, percentage of income reserved for servicing debts and other costs you may need to consider, including Stamp Duty. A unique URL that you can bookmark and return to later, or share with someone else. I'm coming to that time in my life where I'm beginning to think about buying a house. The single most frustrating thing to me has been trying to wrap my head around the myriad of topics you need to learn about mortgages and how they work. So I embarked on writing this mortgage calculator to help me see whether buying could be a viable option considering my financial situation. It is worth noting that there are plenty of similar mortgage calculators out there on the web that perform the same function, e.g. However I felt these were lacking some critical information such as interest rate rises or not taking into account your take home pay. 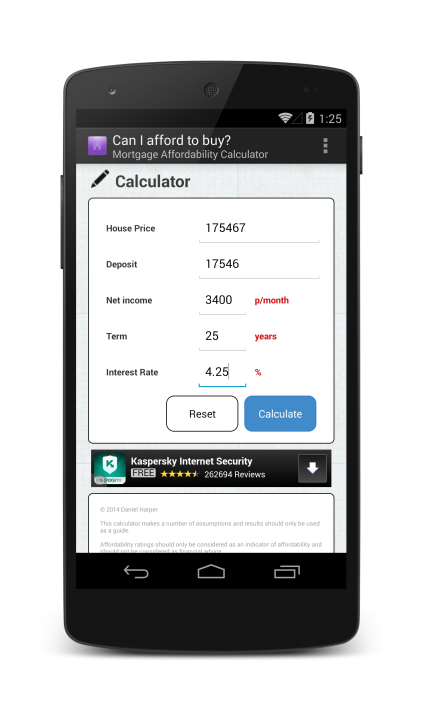 As an excuse to start learning Android development, a version of this calculator is now available on Android devices. You can download Can i afford to buy? for free from the Google Play store. Couldn't you have just done a spreadsheet? Sure, but sharing spreadsheets isn't as fun as writing a website. My name is Daniel Harper, I work as software developer in London. For enquiries of a professional nature, you can try contacting me on LinkedIn, however I cannot guarantee a reply. glyphicons.com for the excellent icon set. Subrat Nayak (ipapun) for the home icon design, part of the "Devine-Icons Part 2" works available at this location. I have modified the colour of the works to suit the purposes of my design. This is licensed under the Creative Commons Attribution by license. Not in London, where I live. © 2018 Daniel Harper | v0.4.2710.4 | Glyphicons are from glyphicons.com | This website does not constitute as financial advice.